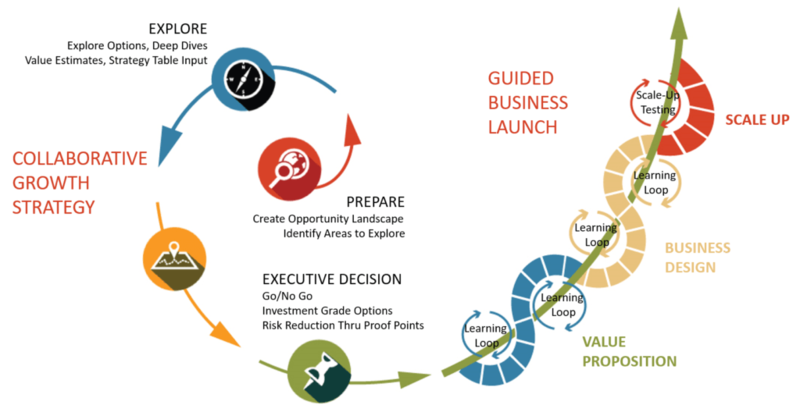 Inceodia, and our partners at Innovation Catalyst Group, lead a large public land-grant university through our collaborative Adjacent Business Strategy program to discover new innovative business ideas that addressed the needs of unserved or underserved learner audiences. Innovation Catalyst Group (ICG)’s growth strategy methodology works with clients to prepare for innovation, explore ideas and converge on investment-grade innovation proposals for consideration. The state’s largest public research university has 32,000 on campus students, plus another 35,000 online students around the world. Their programs and research emphasize their legacy in technology, engineering and agriculture. Launched 10 years ago, their online education program has been ranked top 10 in the nation for three straight years. The challenge for the Special Assistant to the Provost for Innovation was to uncover underserved learner audiences that could generate new revenue for the university through new programs that satisfy long-term learning needs. By starting with underserved audiences and focusing on their needs and wants, rather than trying to adapt an existing program to potential needs, the innovation team stepped away from the typical expert model that has driven higher education for more than 300 years. Probably the biggest barrier to innovation was the bureaucracy of the organization itself. Heavily steeped in the traditional model of on-campus students who dedicate their university time exclusively to their studies, they were excluding a large portion of potential students who were just as dedicated to academic success. Any student who wanted to achieve a degree, any business who wanted to do research with or hire from the university had to fit a rigid “customer” mold that had not changed in the past century, even while the world around them had changed significantly. The innovation team recognized that the source of their growth was not going to be from additional programs offered to their on-campus students; the cost of education and the increasingly available lower cost alternatives meant that there was little wiggle room within this revenue source. They were going to need to look at a much broader set of potential students whose needs were not well understood by the university. In addition to the revenue goal for the project, the team also had a loftier goal – to change the culture of the university to be more nimble, quicker to innovate and more attuned to the needs of all potential learners not just the 18-year-old bound for an on-campus experience. To address this goal, they looked not just at new offerings, but also at how these offerings were discovered, implemented and deployed. What needed to change in the DNA of the university that would allow these new ideas to be developed without undue friction, the “that’s how we’ve always done it” chorus that keeps innovation from happening? What new processes or people would be needed to ensure they could easily explore new opportunities in the future? We have found through our collective 100 years of consulting that the best possible strategy is developed hand-in-hand with our clients. This business strategy provides focus for business leaders in the field of play, and is crafted to evolve during the launch phase of the business. With that in mind, we alternated between teaching and collaboration with the innovation team. We launched each of the Prepare, Explore and Converge phases with an applied learning workshop that introduced new approaches in design thinking, strategic market fit and business commercialization. Then we worked as members of the team through the phase to do the homework required for successful exit. Prepare Phase – We started this phase with a workshop on using design methods to discover unmet audience needs that could be met by the university, along with a workshop on market sizing. We explored the needs of 41 unserved audiences through the development of “idea resumes”. The focus was on audiences that the university did not currently serve, looking at pain points and compelling reasons to serve that audience. We immersed ourselves in understanding the world from these audience perspectives, including the solutions that were currently available to them but purposely avoiding inventing new solutions. From these 41 idea resumes we selected 6 to explore further in the next phase. Explore Phase – Starting with the 6 audiences, the workshop that kicked off this phase delved deeper into design thinking tools such as interviewing, journey mapping and jobs-to-be-done. We provided tools and templates, and then worked alongside the team to conduct interviews and observations with their audience members. Once we had a good idea of the pain points our audience encountered as they pursued their research and education goals, we brainstormed solution ideas that would solve the pain points and deliver lasting value to these audiences. We exited this phase with 2 audiences and solutions captured in a value proposition map and a business model that ensured our solution assumptions allowed us to meet the revenue target. Converge Phase – In this phase, we invited university leaders and stakeholders to join us in a 1-day workshops for each of the 2 selected audience/solutions to help refine the service design and ensure organizational ownership of the new business ideas. We introduced the idea of strategy tables, which explored strategic operational decisions that would be key to the success of the selected solution. We also explored proof points and introduced uncertainty analysis, capturing the collective knowledge of participants to define the organizational milestones that would be required to prove the success of the solution – things like number of students enrolled, faculty enlisted, partnerships established, programs developed, etc. We took these solutions back to our audience interviewees to gauge their interest and refine subtle details we had missed. We exited this phase with 2 investment grade proposals – an “ask” of leadership for money and resources, and a target goal for proving the return on investment through yearly milestones. Gateway – this program would provide a 2-year online program that would serve as a gateway to a bachelor’s degree for the almost 300,000 students traditionally enrolled in community college. For this audience, we found that while 80% of community college students aspire to a bachelor’s degree, only 11% complete. The focus of the program is to increase the 11% by enrolling students in the Gateway program that would guarantee transfer of credits, provide student success counseling and assist with degree pathways and financial aid for a fixed price. University to Business Engagement – this 2-pronged program provides research and training through corporate partnerships to enable application of new technologies or business methodologies such as artificial intelligence or lean startup. For this audience, we found that businesses were facing significant skill and technology gaps which were not being addressed by current training, consulting or university services. The university’s engagement with a business would start with applied research that tested the viability of applying an emerging skill to their business, followed by the development of a corporate education program that would be 80% industry standard and 20% company specific. The innovation team developed the strategic investment proposals and we helped to create the backup data – the appendices that provided the business justification for the investment. We also worked with the team to define an innovation hub that would embody the approach they applied, paving the way for development of new ideas in the future and allowing a more adaptable, innovative university culture to emerge. Once approved, we will work with the team to deepen their learning in new business implementation and help to shoulder some of the work entailed in launching a new business entity.